OSLO, Norway — With a large portrait of a smiling Liu Xiaobo hanging front and center, the chairman of the Norwegian Nobel Committee crossed the dais and gently placed the peace prize diploma and medal on an empty chair. Ambassadors, royalty and other dignitaries rose in a standing ovation. The man they honored wasn't there Friday — he is serving an 11-year sentence at Jinzhou Prison in northeastern China for urging sweeping changes to Beijing's one-party communist political system. And there was no news coverage of it in China, where foreign television news channels went black as the ceremony began and authorities denounced the award as a "political farce." It was the first time in 74 years the prestigious $1.4 million Nobel Peace Prize was not handed over. China pressured foreign diplomats to stay away from the ceremony, with 16 other countries joining their boycott, including Russia, Pakistan, Iran, Venezuela and Cuba. At least 46 of the 65 countries with embassies in Oslo accepted invitations. Committee chairman Thorbjoern Jagland drew the first of several standing ovations from the international gathering of 1,000 guests at Oslo City Hall when he noted that neither Liu nor his closest relatives were able to attend. "This fact alone shows that the award was necessary and appropriate," he said. He brought the crowd to its feet again when he declared: "He has not done anything wrong. He must be released." China was infuriated when the Nobel committee awarded the prize to the 54-year-old literary critic, describing it as an attack on its political and legal system. Authorities have placed Liu's supporters, including his wife, Liu Xia, under house arrest to prevent anyone from picking up his prize. 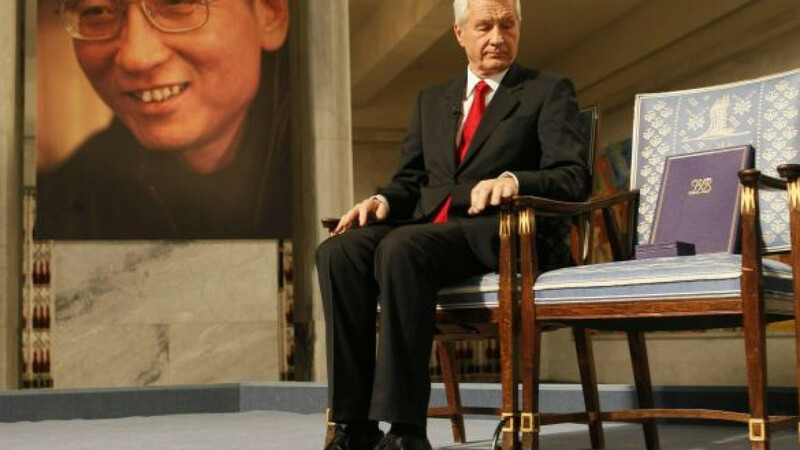 After Jagland drew another standing ovation by placing the medal and diploma on Liu's empty chair, Norwegian actress Liv Ullman read the dissident's statement, "I Have No Enemies," which he delivered in a Chinese court in 2009 before he was sentenced. In the speech, Liu portrays the surprisingly positive and gentle nature of his correctional officer while awaiting trial, which gave him hope for the future. That "personal experience" caused him to "firmly believe that China's political progress will not stop," Ullman read. "I, filled with optimism, look forward to the advent of a future free China," she quoted Liu as saying. Lynn Chang, a Chinese-American violinist, then performed a haunting Chinese melody, "Colorful Clouds Chasing the Moon" and "Jasmine Flowers." But ordinary viewers in China saw none of it. Both CNN and BBC TV channels went black at 8 p.m. local time for nearly an hour, exactly when the Oslo ceremony began. Security outside Liu's Beijing apartment was heavy and several dozen journalists were herded by police to a cordoned-off area. Foreign Ministry spokeswoman Jiang Yu said the awarding of the peace prize to Liu reflected a Cold War mentality, infringed upon China's judicial sovereignty and "does not represent the wish of the majority of the people in the world, particularly that of the developing countries." "This political farce will in no way shake the resolve and confidence of the Chinese people to follow the path of socialism with Chinese characteristics, and the scheme by some people will get nowhere," Jiang said in a statement issued after the Nobel ceremony started. In Washington, President Barack Obama said he regretted that Liu and his wife were not allowed to go to the ceremony as he and first lady Michelle Obama did when he won the peace prize last year. "Liu Xiaobo is far more deserving of this award than I was," he said. U.S. House Speaker Nancy Pelosi, who attended with U.S. Ambassador Barry White, told The Associated Press that "Liu Xiaobo has been a hero to all of us." About 100 Chinese dissidents in exile and some activists from Hong Kong also attended. Chinese dissident Wan Yanhai, the only one on a list of 140 activists in China invited by Liu's wife to attend the ceremony, said the jubilation felt by many at Liu's honor will be tinged with sadness. "He did not do any harm to the country and the people in the world. He just fulfilled his responsibility," Wan said. "But he suffered a lot of pain for his speeches, journals and advocacy of rights." After the ceremony, a torchlight parade meandered through Oslo's dark, snowy streets and ended at the Grand Hotel where the laureate normally spends the night. Hundreds of torch-bearing demonstrators gathered near the hotel and chanted: "Democracy Now" and "Free Liu Xiaobo." Outside the parliament, the Norwegian-Chinese Association held a pro-China rally with a handful of people proclaiming that awarding the prize to Liu was a mistake. Chang, the violinist, said his performance came at a cost. "I will be not permitted to go visit China [professionally] or to play or to teach," he said. "That would be, I think, a big loss — the absence of students that come from China to visit and study in the United States and to work with me also would be a big loss." Also Friday, a group of Nobel laureates, including former South African President F.W. de Klerk and Nazi death camp survivor and author Elie Wiesel, offered to mediate with China for Liu's early release. The last time a Nobel Peace Prize was not handed out was in 1936, when Adolf Hitler prevented German pacifist Carl von Ossietzky from accepting his award. The German media — which by then was under Nazi control — initially stayed silent on the award, but then German newspapers reported on it in overwhelmingly negative terms on Nov. 25, said Johannes Tuchel, a professor with the German Resistance Memorial in Berlin. The papers described the award as a scandal and Ossietzky as a traitor. China's fury at Liu's award has reached proportions last seen during the Soviet and Nazi regimes. But even Cold War dissidents Andrei Sakharov of the Soviet Union and Lech Walesa of Poland had their wives collect the prizes for them. Myanmar democracy activist Aung San Suu Kyi's award was accepted by her 18-year-old son in 1991. The Kremlin forced writer Boris Pasternak of the Soviet Union to decline his 1958 literature prize. French writer Jean-Paul Sartre declined the 1964 literature prize because he had consistently declined all official honors. In 1973, North Vietnamese negotiator Le Duc Tho was awarded the peace prize jointly with U.S. Secretary of State Henry Kissinger but said he could not accept it, citing continued fighting in Vietnam as his reason. Laureates who are unable to attend the ceremony can have their relatives pick up the award and prize money, even at a later date. If an award is not presented, as in the case of winners declining the prize, the money is returned to the Nobel Foundation. In the Swedish capital of Stockholm, the other Nobel laureates were honored in a separate ceremony Friday. Winners in literature, physics, chemistry and economics received their awards from Sweden's King Carl XVI Gustaf.